Lina lost her mother and was tossed into an unfamiliar world with a father she didn't know, a country she had never been to, and a culture she was unprepared for. I enjoyed watching Lina navigate her new life, and the journal she inherited from her mother was just icing on the cake. Lina's mother was a prominent character, and we mostly only see her through journal entries. Despite that, the author makes Hadley (her mother) stand out and claim part of this story as her own. I loved listening to those entries and trying to solve the mystery along with Lina and Ren. Ren was the sweetest guy and was eager to help Lina find her footing in Italy. They ran into each other on accident, but their relationship made me believe in fate. They were meant for each other, and I liked watching their relationship grow despite some obvious problems. I'm happy Lina decided to share her mother's journal with him, because adventures with Ren were infinitely better than sulking solo. I also adored Howard (her father). He didn't know Lina existed until shortly before she came to live with him. He did everything he possibly could to make sure she felt welcome and was comfortable. He didn't try to force her into conversations she wasn't ready for, or try to be an overbearing parent, but simply let her live and gave her room to breathe. Howard knew she was hurting and needed time to adjust before they tried to move forward. Lina keeps in touch with her best friend by making random phone calls and video chatting. Again, the author brilliantly portrays a secondary character with very little information. It was like we'd all been friends forever. It was such a wonderful reading experience on so many levels. I've never had a strong desire to visit Italy, but now I have an itch. Jenna Evans Welch has successfully made me want to traverse Italy and see every site mentioned in this book. 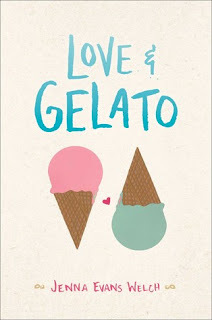 Love & Gelato is my own version of Lina's mom's journal. It will be my map to secret bakeries, interesting sculptures, and the best gelato in the world. I cannot recommend this one enough! I just added this to my wishlist so dang fast - hopefully my library has it. It sounds perfect for me right now; totally something I'm in the mood for. It's hard not to get enthusiastic about this one! The story and characters are infectious. I have a blogger friend, Sam, who *loves* this book so much. It sounds like it has so much going for it. I like the fact that her mother is such a presence in the story, even though she's not really present. And her father sounds wonderful - supportive and caring. And Ren sounds like the perfect book boyfriend. :) I'm so glad this was a hit for you! I DO love this book! I was so happy to see Lindsi liked it too. And yes Tanya, Ren was a beautiful soft boy, just the way I love them. Tanya, I'm surprised you haven't read this one! It seems like something you'd really enjoy. The romance is subtle, but meaningful. They're both dealing with separate issues that sort of get in the way, but their feelings are always there. Her mother was a force, and I hate that she died when she did. It opened up an entirely new world for Lina, but it was still a world without her mother. I also wish her mother had made some slightly different choices. Beautiful story with wonderful characters! Sam, I LOVED it! I thought Ren was adorable, caring, and thoughtful. I really loved that he was afraid of Howard (who is just as sweet) because Howard thought he was one of the guys that chased her down in the car, haha. He never got over that! Then the coins, the scooter rides... ahhh it was perfection. 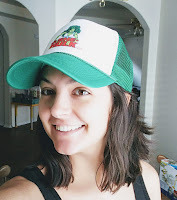 Lindsi - Sam's review was convincing but I'm reading less and less YA (just feeling more inclined for adult reads) but now with your review on top of hers... I'm caving! LOL I'll add it to my library list and try to get to it sometime soon(ish). I cannot wait to see what you think! I don't read as much YA as I used to, but there are still certain titles that I cannot resist! The premise for this one was just too enticing. <3 I've started reading more and more NA/Adult books, too. I need to read this one. Everyone is loving it. That sounds good and like everyone else said, I'm seeing it all over and everyone is loving it. I've been meaning to pick this book up since it came out, I just haven't gotten around to it. It sounds like such a perfect book for summer. I really need to get to this one. Thanks for your review. Glad to hear you really liked this one! It does seem like a lovely summer read. I liked this one so much! And I agree- makes you want to visit Italy! I can't wait to read her next one and see how she handles Ireland. I liked Lina and Ren as well- they made an awesome couple, and Howard was great too. I really had no complaints about this book. I'm starting to think I was one of the last people to read this one! Why did I wait so long?? Like you, I cannot wait to read Love & Luck! I liked her Addie/Addy in this one, even though she's only mentioned when they video chat and talk on the phone. Her personality seemed so big and like she'd be a lot of fun to read about. I just finished this book last week too and adored it! I've been to Florence once and I think she just captured it so perfectly. Now I really want to go back, lol. After reading this one, I know I'll have high expectations when I visit Italy for myself, so I'm happy to hear she captured it perfectly! I've been to Germany, but none of the places she mentioned in the book. How was Florence? 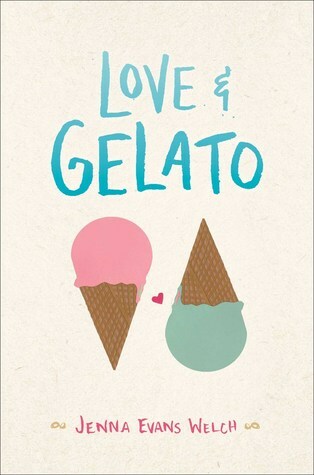 Have you had gelato? My experience was pretty magical as well, lol. This sounds like a fun summer read. Love the foreign setting and the role family plays in this. Adding this to my TBR! I have this on my shelf. Sounds like I should get to it sooner rather than later! I like how the MC's mother, even though she isn't around, is still a big part of the book, through her journal entries. And an Italian setting is always good! Yes! I felt like Lina's mother, Hadley, was another character. It was interesting to learn about her college years and first experiences in Italy. It was like Lina got to experience those things with her mom and learn a little more about the person she used to be. Her mother never spoke about her time in Italy, or the things she did, so it was new information for everyone. I guess I should say another prominent character, because just being in the book makes her a character, haha. It doesn't happen before the book starts, but right at the beginning. You see Lina with her mom (briefly) before the story skips ahead to the summer. There are a few references to that time, but mostly her mother's presence is just from the journal. Do you not like books that have death? It's been in the 100's for the last two weeks here. I would probably bathe in gelato at this point. Do they make vegan gelato? I tried gelato when I went to Germany, but that was before I became a vegan. I guess it's something I'll need to Google later, lol. This is one of my favorite books and I love reading this in the summer. I've been to Florence and Jenna definitely transported me back to Firenze. I just saw this on one of the Goodreads YA lists and realized that it really hasn't been on my radar. Glad to read a review---you've made me want to read it!